Approximately 4,500 adult trout were stocked this week by the Michigan Department of Natural Resources in the Clinton River (Auburn Hills), the Huron River (Proud Lake Recreation Area) and Spring Mill Pond (Island Lake Recreation Area) in southeast Michigan. These fish are retired broodstock (mature fish used for breeding) from Michigan’s state fish hatcheries. The Clinton River, at Riverside Park in Auburn Hills, was stocked with 500 brown trout ranging in size from 13 to 17 inches. The Huron River was stocked with 1,700 brown trout and 1,200 rainbow trout, all ranging in size from 13 to 19 inches. Spring Mill Pond received 600 brown trout and 500 rainbow trout, both ranging in size from 13 to 20 inches. The Huron River at Proud Lake Recreation Area is closed to fishing Oct. 1 through March 31. 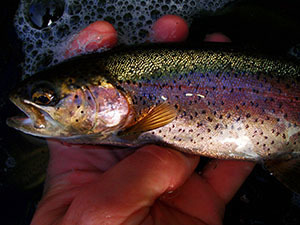 April 1-26, anglers are limited to flies only, catch-and-release fishing. Spring Mill Pond at Island Lake Recreation Area is closed to fishing March 15-31. April 1-26, anglers are limited to artificial lures only, catch-and-release fishing. On both waterbodies, beginning April 27, all baits are allowed, and anglers may keep up to five trout over 8 inches, but only three trout over 15 inches. Due to elevated PFOS levels in fish and water, the Huron River is under a “Do Not Eat” fish consumption advisory from Wixom Road south to Lake Erie. The main source of contamination in Norton Creek has been addressed, but the advisory is still in place until further testing. Touching the fish or water is not considered a health concern. For more information go to Michigan.gov/PFASResponse and search for Huron River. The fish stocked this year in Spring Mill Pond are not affected by the consumption advisory, because the pond doesn’t connect to the Huron River. Get additional details in the 2019 Michigan Fishing Guide, available at Michigan.gov/DNRDigests. /Note to editors: An accompanying photo is available below for download. Caption information follows.